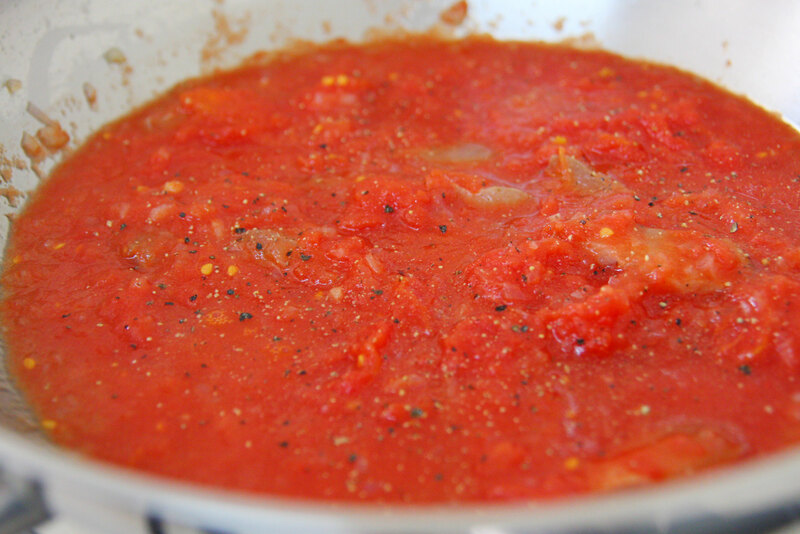 I’ve made amatriciana twice in the past, each time getting closer to the authentic version. This time however, I have finally reached the promised land! With some luck, I managed to buy all the necessary ingredients to make 100% authentic amatriciana, with guanciale being the one that was the hardest to get. And this is a slab of the extremely rare guanciale – heath-conscious people please don’t see or you’ll get a heart attack! 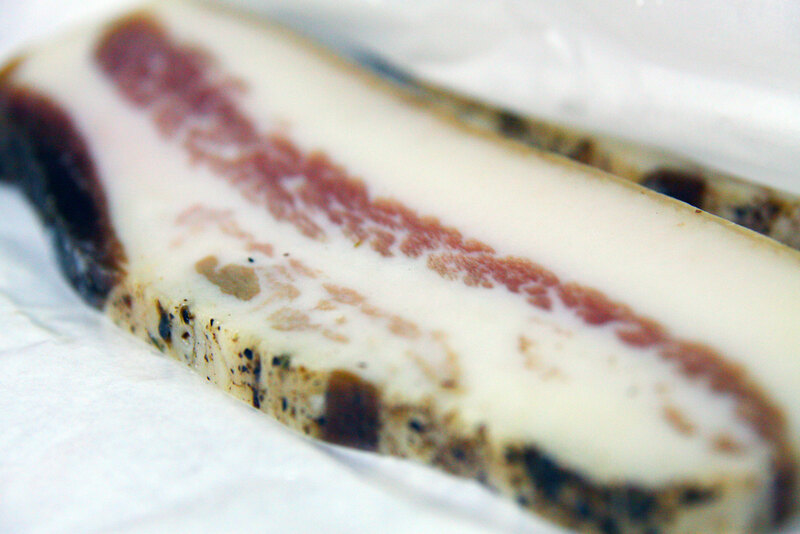 Guanciale is the cured meat that is usually used in most of the Italian recipes but since it is also usually quite rare, the typical substitute used is pancetta. 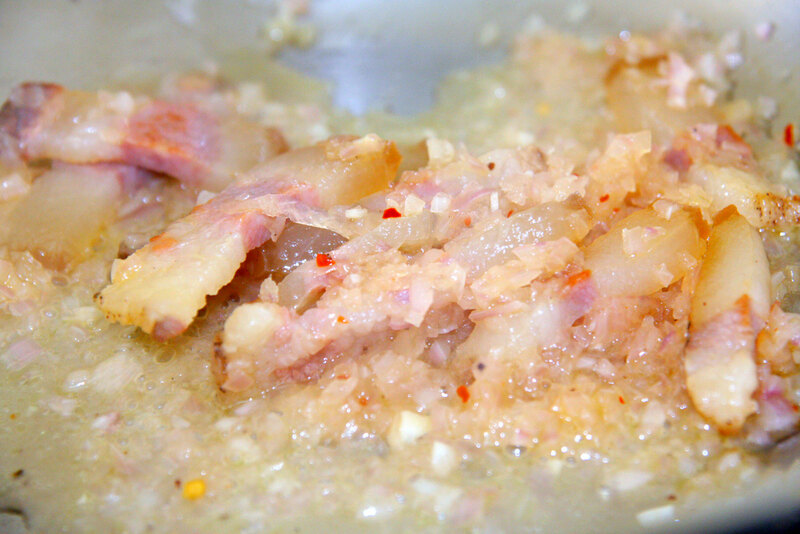 It’s made by curing the pig’s cheek, which gives it a strong and much more gamey flavour. 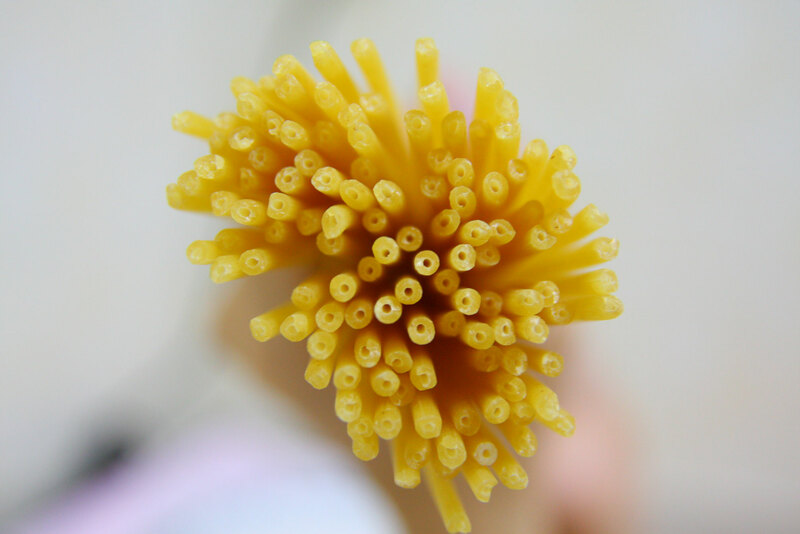 And the other ingredient in the name, bucatini, which is a type of pasta that is like spaghetti but hollow inside. This traps some of the sauce inside and carries it to the eater. First off, we have to saute the guanciale. All you need is a little bit of olive oil and the rest will be rendered from the fat of the guanciale. Fry until nice and crisp on the outside, not too long. Then we set them aside and leave the oil in the pan for other uses. 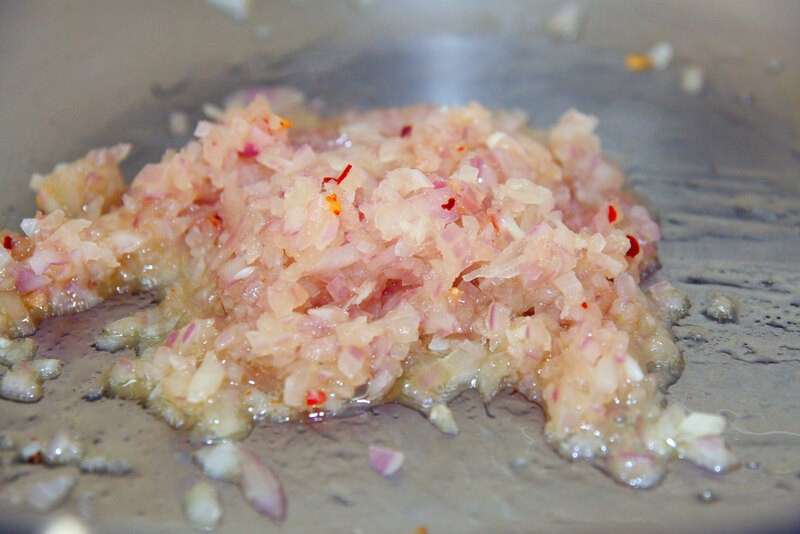 Next we sauté chopped onions with red chilli flakes in the guanciale-infused oil. Once the onions turn translucent, we add the guanciale back in and splash in some white wine that we simmer for a minute or so. Now we can finally add the tomatoes and simmer! Finally toss the bucatini in the sauce and coat with pecorino romano cheese! And that is my authentic bucatini all’Amatriciana! It has this really rich and porky taste to the sauce, and the fat of the guanciale is not soft rubber like the usual pork fat but instead has a crisp and crunchy texture to it. It’s one hell of a pasta dish and I’m glad I was finally able to use guanciale to make it. 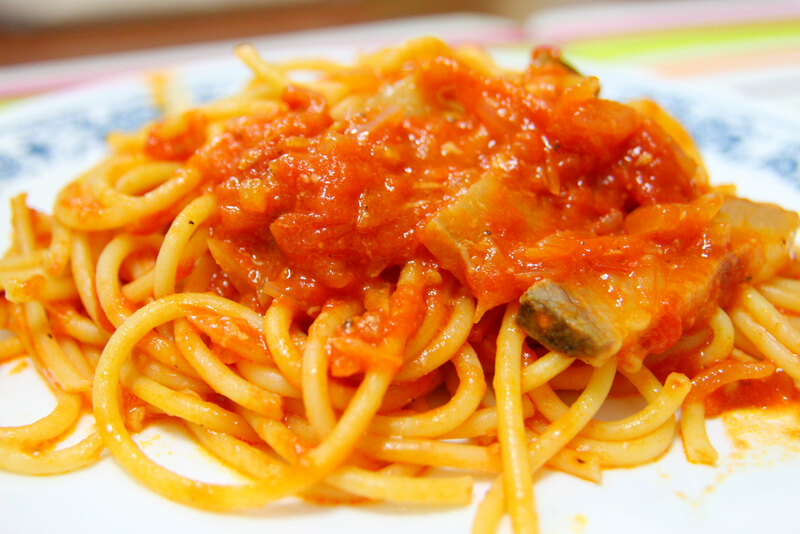 7 Responses to "Bucatini all’Amatriciana"
It’s so simple and it looks delicious. I must try this! Thanks! 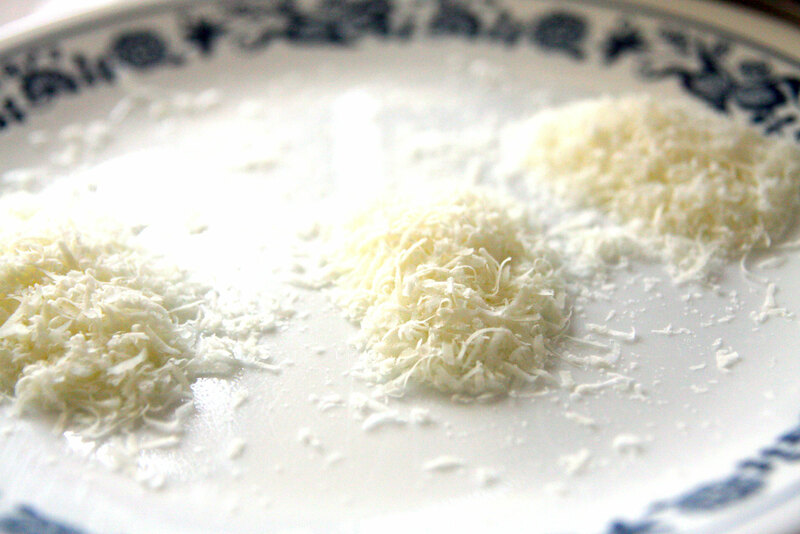 It is really simple and tastes very delicious! You can just use bacon or pancetta in place of guanciale. wow where did you get that awesome slab of guanciale? Your pasta looks delicious. I bought the guanciale at this Italian food specialty shop in the basement of Liang Court called Quattro Stagioni Deli.The unit number is #B1-27. 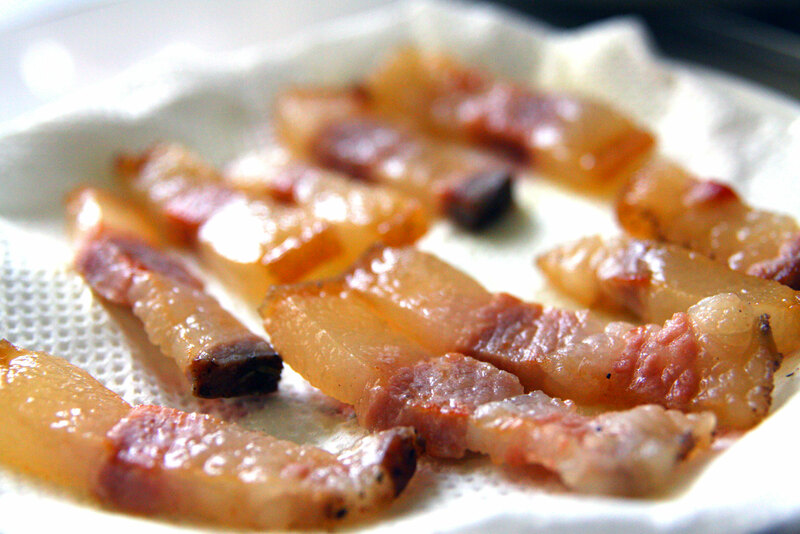 fantastic..:) you can try to cook guanciale directly with onion without fried..